I’ve been stockpiling pictures and thoughts for a post on Jacob colors, but never seem to have the time to pull them all together into one looooong post. I recently realized that many Jacob breeders do not use the same terms as related to lilacs as I do. The first lilac I ever saw (and eventually was fortunate to own) was Craft’s Praline (Hardy Hill Leo x Craft’s Pia’s Pieris). Praline was advertised as a ‘chocolate lilac’ and her color fit her name (cookie-sized candy made of brown sugar and butter and pecans). I use the term “lilac” to refer to a color that breeds true – not to a color that is outside of the realm of a good black. I have had ‘blue’ lilacs, where the fleece was a lovely blue/gray and these sheep did breed true. I do not use the terms ‘chocolate lilac’ or ‘dark lilac’ to refer to colors that are not lilac. Praline at age 10 shows brown facial and leg markings. Her fleece at that age had faded, but still spun into brown yarn. Which is what I want from my lilacs. Praline delivered twins as a yearling and delivered(and raised unassisted) twins and triplets until she was 10. Patchwork Macaroon is her last lamb. I’m doing some yarn and fleece samples of the different colors to post in chapter two (or three). These three lambs were gracious enough to pose in a way that helps to show off the differences in their colors. Since monitors differ, I hope that adding a gray card might help. 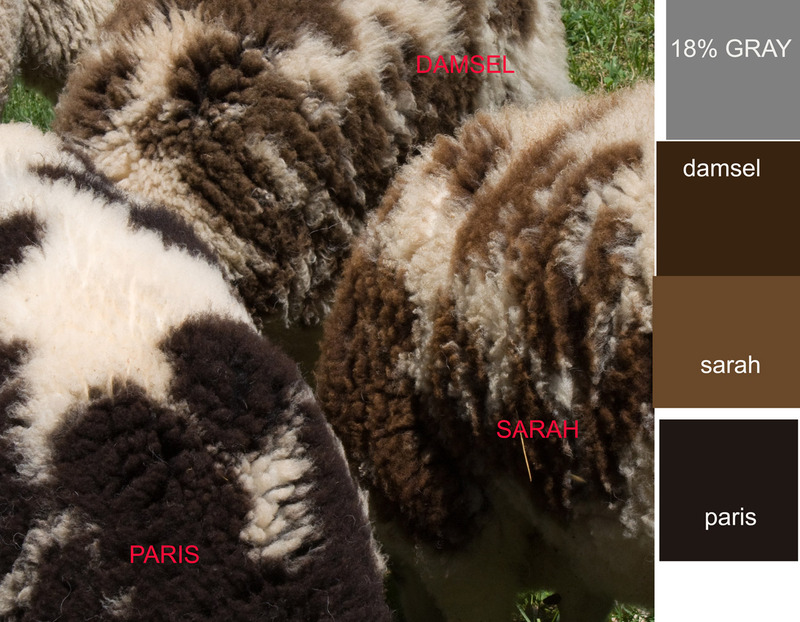 In Photoshop, I used the eyedropper tool to click on the color of each sheep that looked to represent the color most correctly on my monitor and then filled a box with that color. Sarah is sunbleached black and her PS color doesn’t look quite right to me, but that’s what PS said. 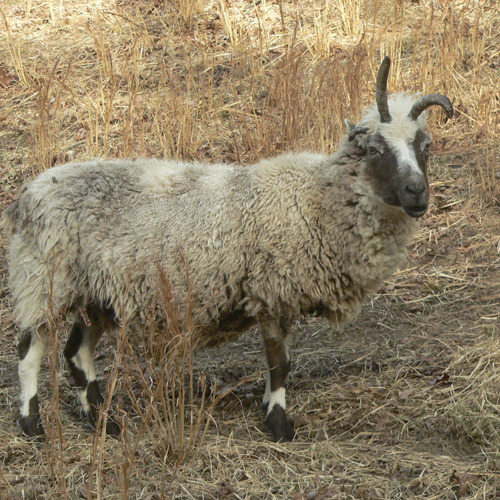 Damsel is a chocolate lilac – with chocolate facial/leg markings and a chocolate fleece. Paris is a black/white with especially nice color retention and no sunbleaching.